If you're looking for a clean and professional manual business check, this is just the thing! Get our classic Multi Purpose Checks with a lot less clutter. We've removed the invoice boxes from the face of the check giving you a lot more room to work with. 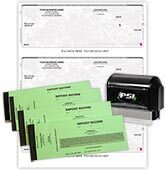 Just like every version of our multi-purpose checks, this product can be used for both general disbursement and payroll purposes. The detachable stub has space for you to record deductions, hours and more. 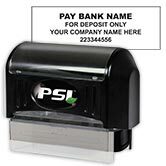 Choose the Multi Purpose No Invoice Checks right now and start taking advantage of this convenient tool! And if clean and uncluttered is your thing - don't forget to add a 7-ring binder or comb binder to keep your new checks organized.